19 September, 2014. EOTopo 2015 production update and behind the scenes news; last chance to buy National Gathering raffle tickets online; flowing asparagus? and this week's Super Specials. There's so much work going on in the office on EOTopo production that we hardly had time to prepare this week's newsletter but better late than never! Production Update - EOTopo200K 2015 is not far away from being ready to go into production - BUT not quite....It's been high-gear over the past 2 months and despite a sense of nearing the end, we just keep adding more. In truth, this could be a never-ending task! Previous editions of EOTopo200K utilise a large amount of legacy data (sourced from Government surveys). For the first time, our new release will contain infrastructure, geography, heritage, recreation, and population data that has been extracted from our online Places database. This will resolve many known legacy errors, however it has also created some new complexities. Because this is our first time the new data has been extracted in this way, we know there is still a lot more work to do to refine and improve both the content and styling. We have leaped many steps ahead with EOTopo 2015 but there are also many new small issues that will take time to resolve so these will be done in future updates. More than ever, we will want collaboration from our network of ExplorOzer's because updates from travellers like you will always remain a critical avenue to improvement. We will also have plenty of tasks for our Places Administrators. Road re-alignments, or new roads can be supplied to us by uploading your track files to the ExplorOz User Treks system. Corrections to names and positioning of data features can now be made directly online - simply go to Places. Once you've located the precise feature you wish to correct, you can click the ALERT ADMIN button to provide us with information we can use in the next EOTopo update. Stay tuned, for news of the release of EOTopo 2015. Both the online version and the 200K product is planned for release in October. 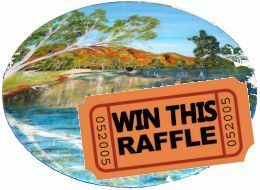 Last Chance to Get your Raffle Tickets - just 12 days left for those still wanting to buy raffle tickets online for this wonderful hand-painted saw blade that will be drawn at the National Gathering in Trilby on Wednesday 1st October. All funds from the sale of tickets will be donated to Louth RFDS clinic. Safe travels to all those heading off soon to meet up in Trilby. We hope to see your photos and stories in the blogs soon. Bloomin' News - The name asparagus conjures up a culinary treat – but the Asparagus family includes some very varied and attractive wildflowers too! 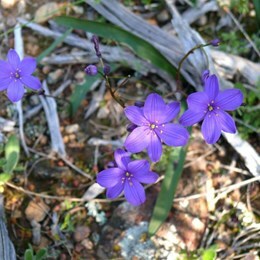 The fairly common Blue Squill is found across a wide area of SW WA. It has edible tubers too. Other members of this diverse family include the lovely mauve fringed lily, often found delicately twining through larger shrubs, and the tufted Lomandras with incredibly sweet perfume but often called Cockies Bootlaces because of their tough wiry appearance. 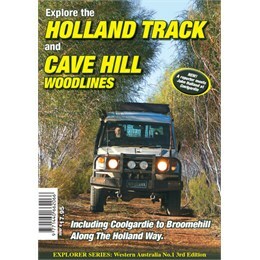 Explore the Holland Track & Cave Hill Woodlines 3rd Ed - This book includes trip notes for the Holland Track, the John Holland Way and the Cave Hill Woodlines. These are coupled with GPS waypoints and descriptions of the various fascinating features you'll discover along the way. In this new edition all trip notes and pictures have been fully updated and lat/longs are included as waypoints. This title also features a first person account of a reporter meeting John Holland as he rode into Coolgardie. Available now from the ExplorOz Online Shop.